Where do I begin??? We have had excitement from Kimber these past couple of days. On Wednesday I woke up around 4:30 having contractions. They got pretty intense and close so when Dustin woke up I decided we should go to the hospital. When I got there, they put me on the "richter scale" monitor. My contractions were 2-4 minutes apart and hitting the 60s on the scale. If you don't know a 60 is pretty intense. I never even felt a contraction with Addie Lee! Well, about 30 minutes later the nurse told me that it was only Braxton Hicks and that he was not on his way, but we had to wait for the doctor to be sure. So, 4 hours later the doctor came by and said they were Braxton Hicks but I could not go home until the contractions stopped...so at 5 pm (8 hours after getting to the hospital) we got to go home. I was told to come back if it happened again because the only way they would know if I was in labor was by them checking me. So, of course on Thanksgiving Thursday I began having contractions again...5 minutes apart for 30 minutes. So I went back to the hosptial and can I say that the nurse was a real witch (to put it nicely). First, she did not come to the window when she saw me...like I was there for fun at 8 1/2 months pregnant! Then, she made me feel like a complete idiot for coming and tried to explain to me that he still has to come WAY down before he's ready! Well, needless to say an hour later we were on our way home! I've had contractions since then but we're still holding on...we'll see! Addie Lee loves shoes and saw my high heels and wanted me to put them on her...she was even able to walk in them. 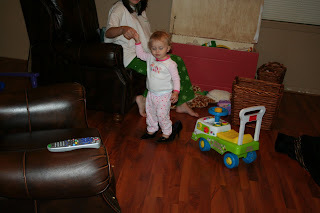 I must say I'm training her right...High Heels from Ann Taylor, boy does she have taste! I don't know if you can see them but they are about 3 inch heels! she is very talented! 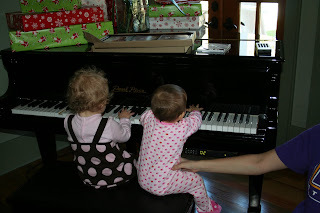 Playing the piano, a duet of course. They were both playing and singing. With her parents, Addie Lee has no choice of sounding good, but Olivia at least has one chance (sorry KiAnne there was a reason you got a B in choir). 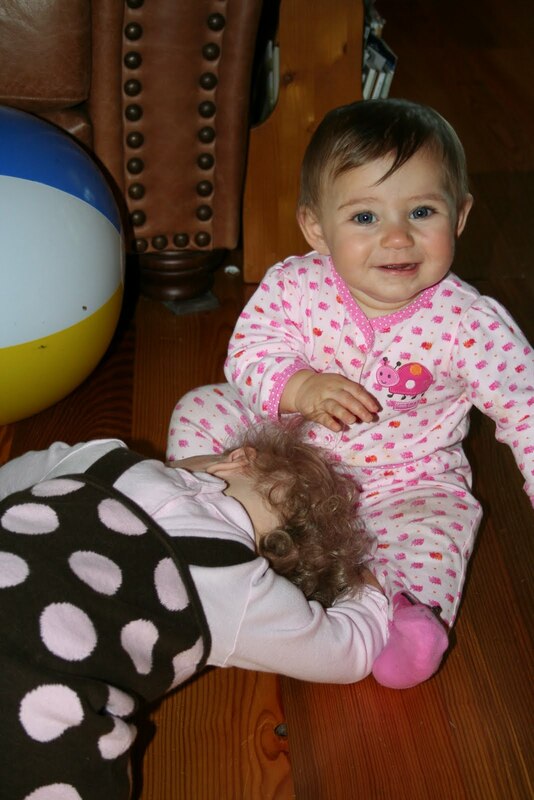 This is Addie Lee loving on Olivia. This was way sweeter than when we had their pics taken! Well, I went to the doctor yesterday and had an ultrasound. Kimber is weighing in at 6 lbs. 10 oz. as of yesterday. He is due to gain about 1/2 pound a week. He is in the go position...head down! All we have to do now is wait. I'm excited for him to be here but still loving my sleep. If he could give me at least 2 more weeks that would be great! Dustin has cancelled his hunting trip to Kansas so as not to miss the birth...he asked Dr. Lee "If you were a guessing man when would he say he would be here?" Dr. Lee said he can come at any time and being that's about 38 weeks I would stay home...so that's what he's doing (I think he had his mind made up before that though!). Anyway, just a short update. P.S. we have pics for our firm website today. I know I'm gonna look great at 36 1/2 weeks pregnant! Hope everyone has a wonderful Thanksgiving! I am so thankful for my wonderful and growing family and all of our friends! I'll keep y'all posted! 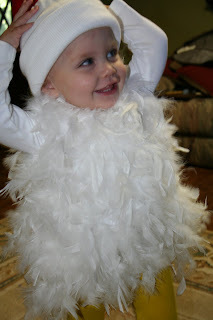 Well, I decided since Addie Lee ate so much chicken she should dress as a chicken for Halloween! 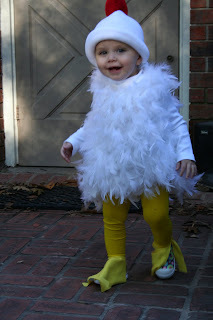 Isn't this the cutest chicken you have ever seen? And to answer the burning question....yes, I made it! Just call me Suzie Homemaker! 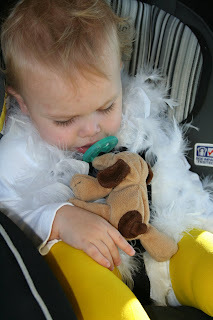 All that trick-or-treating made her tired! 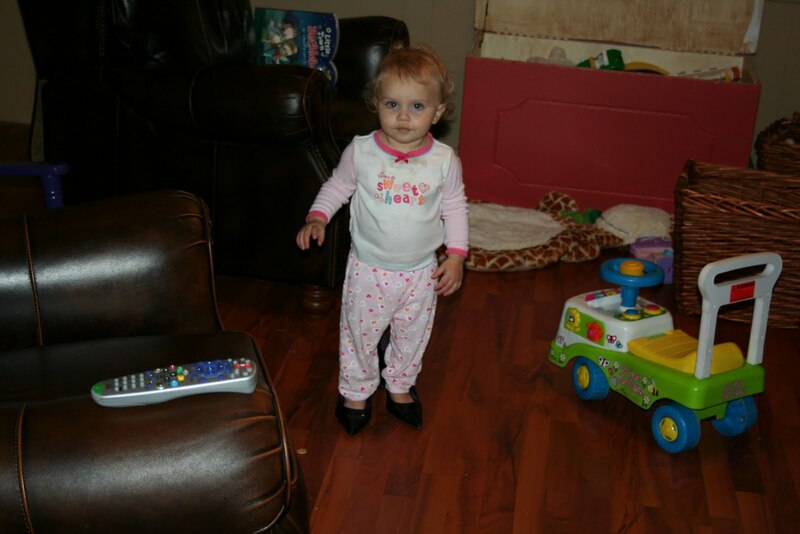 She even did a "chicken dance!" 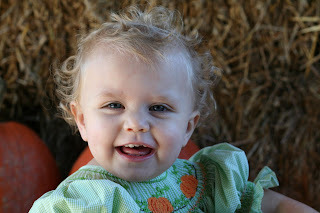 We also went to the pumpkin patch on Saturday. We weren't able to do much b/c it was so wet, but we had a great time! 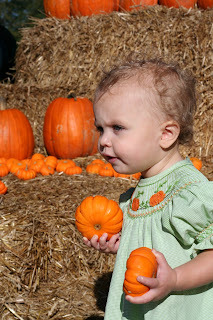 She thought the "munchkin" pumpkins were "balls"! Anyone who has been around her knows anything round is considered a ball and she sees how far she can throw it! Dustin and I began dating in June 2003 while we were both in college (DK at MSU and me at LSU). We married two years later in 2005 and have been happily married since then. 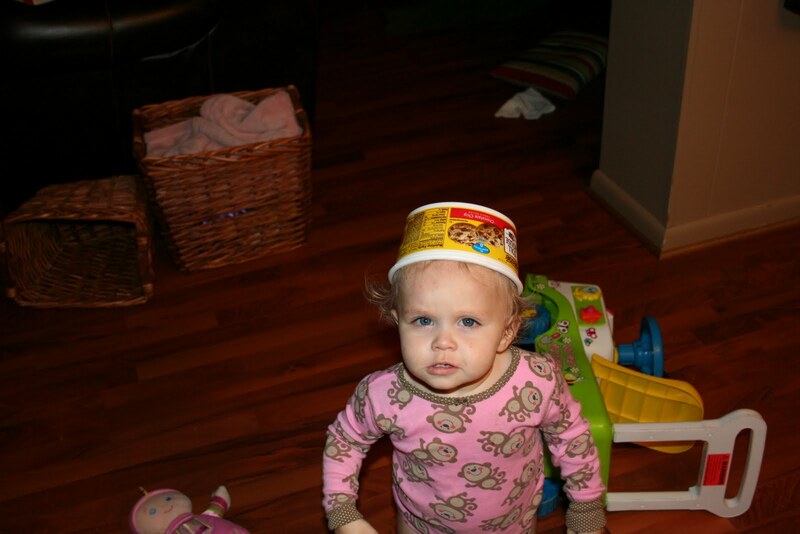 On July 31, 2008, we welcomed our first child, Addison Lee. She has been the joy of our life and this blog is mainly about her...and the little boy to come. We will have our second child, a little boy, in December and we are so excited. We know Addie Lee will teach him all the tricks of the trade!